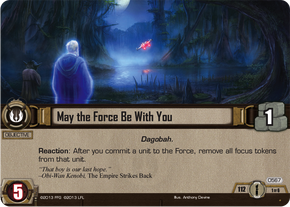 This article continues a series for the St. Tammany Star Wars Gamers, as we continue our slow-grow Star Wars LCG League. Remind you to read Alex’s excellent post about deckbuilding. It really is insightful. Just think on that for a few minutes. And then remember that the objective grants Wookiees Protect Character. And then put those furrballs in your deck! Next, Jedi Ewoks? Really? We’re talking about Ties of Blood here. I like the objective and I like Leia’s Reaction, but I struggle to justify putting her on the board. A 3-cost, 2-health Vader magnet? I dunno. 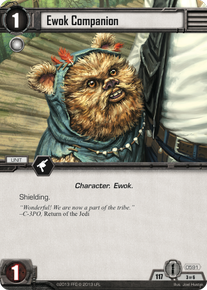 But that Ewok Companion with Native Support?! Just too good to pass up. I mean, seriously. The number of confounding options is significant. I didn’t notice a huge shift in our DS decks last Saturday. Why not? Probably because the core Sith units are still boss. 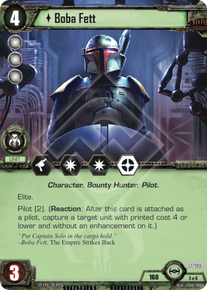 Even in the Rogue Squadron meta, they are still awesome cards. So what regulars are still popping up? I go back and forth on Mara. Yes, she’s awesome when committed to the Force. But do you want her committed to the Force? Targeted Strike only applies when attacking, so unless you have Rage in your back pocket, you’ve got a challenging decision to make. Also, while she costs one less than Vader, she also has one less health and she lacks his awesome Reaction. I put one copy of Mara in my deck, but you’ll have to find how she works best with your strategy. 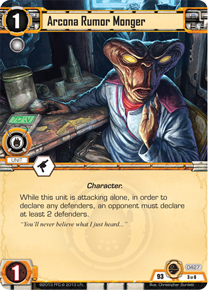 Galactic Scum, like Hired Hands for Smugglers, is a really neat card especially for battling Sleuth Scouts. Not to mention, its objective goes really great in capture decks. For that matter, an edge-enabled tactics for 1-cost with three damage? That’s like three Twi’lek Loyalists for the price of one. For what it’s worth, this set is in almost every DS deck from Worlds 2014. Strategy: get all those cheap little units out there to fight the war, while Obi-Wan and Yoda keep the Force. 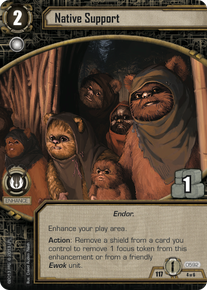 Unmentioned cards worth noting: Yoda, You Seek Yoda, Shistavanen Wolfman, and Executor-killing Yoda. I basically swapped out my Hoth sets with Jerec and Mara’s sets. This may not have been the best strategy, as I got clobbered by Garrett last night. First time I’ve ever decked out in this game. I was going for a control deck, but I think I may need to add in some Scum to help with that. I’m going to leave my decks as is for this Saturday’s games. So get your Sleuths, your Wookiees, your Executors, and your Scum! Let’s do this thing! See you on Saturday. I love this game. Well, I love card games, but SWLCG brings together a lot of good things from other games that make it enjoyable. Just to name a few… The characters are awesome, artwork is phenomenal, the draw mechanic is wonderful, there are no “rare” cards, and we get to play as good AND the bad guys. Now off to the article! I’ve chosen to write about some of my deck building experiences with the hope of passing on some wisdom I’ve learned through the past year or so to you (and so you don’t have to make the same mistakes I did). First off, you have to decide what is your main purpose of the deck? Jason has asked me this countless times when I can’t seem to get a deck going like I want it. 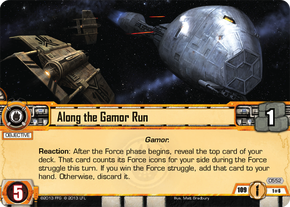 For the light side, do you want to win fast and go agro (rebel speeders or sleuth deck), win the force (Jedi with May the Force Be With You and Along the Gamor Run), set up slowly and win late game (trench run and DESPERATION), or a more control approach (smugglers love them some tactics)? Having this in mind when you whittle down your options to choose the right objectives to go in your deck. After you know what kind of deck you want to build, be VERY consistent with your deck building in the beginning. Use 2 of each objective set, no single set for now. If you do this you will be able to have a better idea of what card combos work well together since you will have your greatest chance of drawing those cards. Even if there is an objective set that you know in the end you will only want one in the deck, play with two for a couple games just to make sure you know how that card will be used. I will explain more on this later. Trial and error really is the best way to figure out if a deck is going to work. Theorizing and deck building is fun (maybe the best part of the game), but it may not work well on the play mat. Build the deck and test it out! Last tip for you today. When starting a deck idea from scratch, start with 2 objective sets with a card or two that uses a combo that is very intriguing. Next, find another set that will combo with those cards or a different card in the objective sets already chosen. After you put the deck together and played a few times. Switch out objective sets to fix areas of your deck that are lacking. I’ll give you an example of one of my favorite decks to illustrate these points. I’ve basically been playing some version of this since I started. I took this deck to my first tournament. I GOT SECOND PLACE… out of 3 people, but wasn’t satisfied with the deck as a whole. Jason asked me what my deck strategy was, and I couldn’t really answer him. The objective sets seemed like no brainers to me at the time. There was some good synergy. 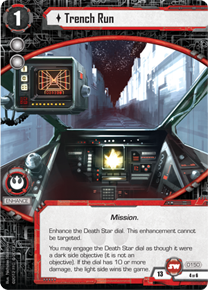 There are some 2 cost vehicles for Attack Pattern Delta, edge 1 for speeders, and Mobilize the Squadrons has a card that puts shields on your guys. That last bit goes well with Preparation for Battle. However, the deck was still a bit slow and my vehicles died quickly since they are low cost. The deck needed a revamp. I decided to go simple. I decided to go with the strategy of flooding the field with cheap vehicles and go from there. I chose objective sets that had at least 2 two cost vehicles in the set except for one. My thinking here was that I now have 20 vehicles out 50 cards that are 2-cost. There is the obvious speeder synergy. I put y-wings with protect vehicle so that my little ships can survive for a longer period of time. Rogue Squadron Assault has Hobbie as a pilot and the objective set works well with the y-wings. The set also has the new fate card “stay on target” that lets me put pilots into play for cheaper, so Wedge gets to benefit from that card. After play testing for a while, I still wasn’t happy. 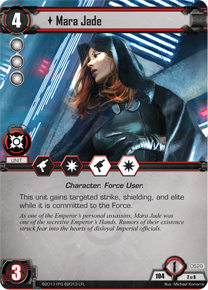 I wasn’t winning the edge as often as I like and the speeder tanks in Prepare for Battle were not as important to the overall strategy of the deck. Also, having 2 Prepare for Evacuation was overkill. There isn’t much in that set other than the y-wings and the fate card that I like. Let’s try it again! So many problems were solved with this list. There is a CLEAR strategy – swarm the field and win the edge. 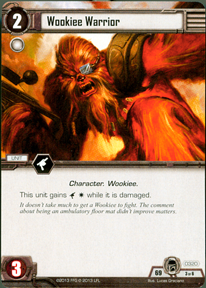 Draw Their Fire has 2 two cost vehicles and Ackbar who is a game changer when he enters an engagement from your hand. 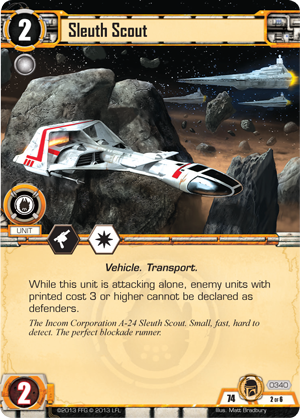 Blue Squadron Support has 2 two cost vehicles who are very strong. Plus, these new objectives can benefit from Rogue Squadron Assault’s ability. I hope this read helped you guys somewhat. Don’t give up an idea too soon. Play test when you can and find that list you are happy with before moving on to the next great idea. Or you can forget everything I said and copy a list online from a tournament winner. See you next Saturday at Big Easy Comics! 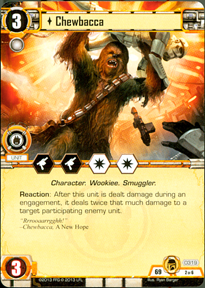 This week, the St. Tammany Star Wars Gamers began our first Star Wars LCG league. Since this post is primarily intended for that group, I don’t plan to go into detail on the LCG model or this particular LCG. There are other wonderful resources that can help you with that. When Alex Lacour and I were driving back from the Houston Regionals for the Star Wars LCG, we made a decision. We had to get a league going. Why? Because we were completely ignorant about the then-current meta. With only two of us playing, we were constantly responding to one another’s deckbuilds with no real idea what was happening elsewhere. So our league has officially begun! 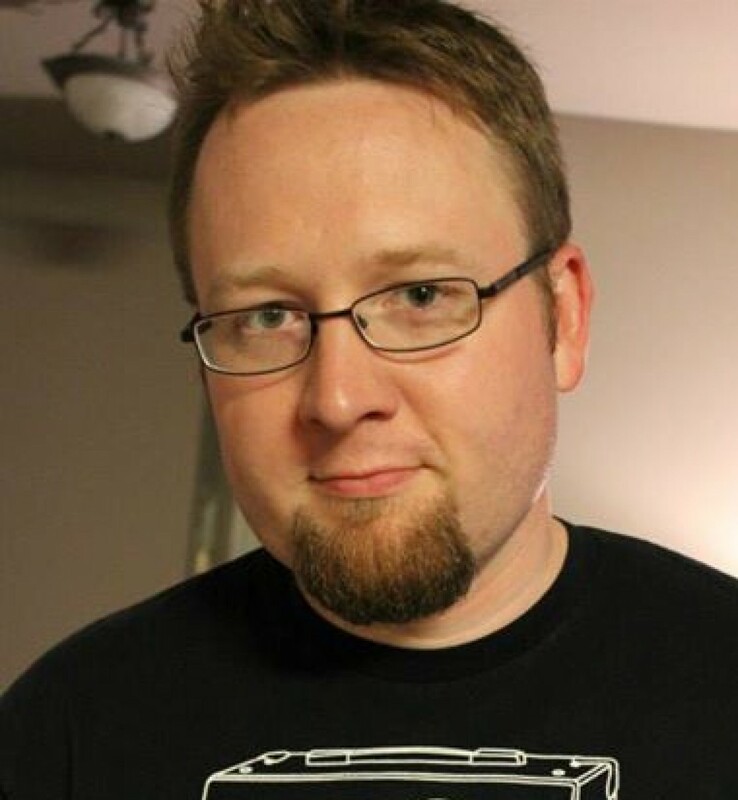 With this series of posts (some hopefully also written by Alex), we want to talk about our current meta at Big Easy Comics and how to strategize in that environment. 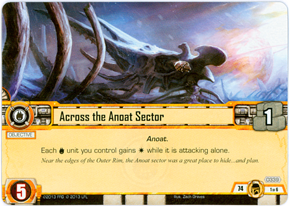 Since we are doing a slow-grow league format, right now the only legal objective sets are those from the Core Set and the Hoth Cycle. We saw lots of speeders and lots of big Sith dudes. Since I went undefeated today, I thought I would post my deckbuilds and talk about the strategy behind them. I will leave my decks the same for next Saturday’s gameday. Feel free to copy my decks or to build your decks to undo mine. No sweat. We’re all learning at this point. Ackbar’s set, Draw Their Fire. Until today, I never realized how awesome this set can be. Yes, it has Trench Run, which is insanely good. 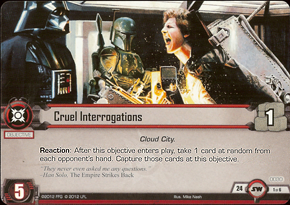 And who doesn’t like a 1-cost/2-damage X-Wing and a Rebel Assault? But look at this card: Covering Fire. I sacrificed Rookie Pilot and shielded seven attacking speeders in my Death Star run against Patrick. It’s just stupid how useful that was. Now we’re getting into our speeders. The objective is just insane. Edge(1) for every participating speeder? Yes, thank you. Now, keep in mind that only works if you have more Hoth objectives than your opponent! I used Wedge to make a ship functionally Elite in one game; in another, to attack twice. I included this bad boy for two reasons only: (1) those frustrating speeder tanks and (2) having more Hoth objectives. Sure, Tauntauns are nice. But those speeder tanks are a headache on your opponent. Plus, they add Edge(1) if Hoth Operations is out there with a bunch of Hoth objectives. I put this in for a copy of Preparation for Battle right before we started. Why? I didn’t need four speeder tanks. And those Y-Wings with Protect Vehicle are pretty boss. Stick those suckers on a force card, let them sit, and soak up damage. 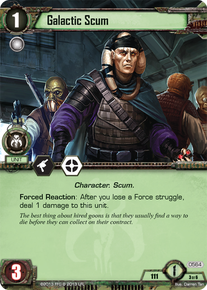 Sure there’s a risk of not having any Smugglers resources out there, but in the grand scheme of things that’s only two units I can’t use. Plus, there’s a Battle of Hoth fate card in there. Did somebody say free freaking speeders? Yes…yes they did. 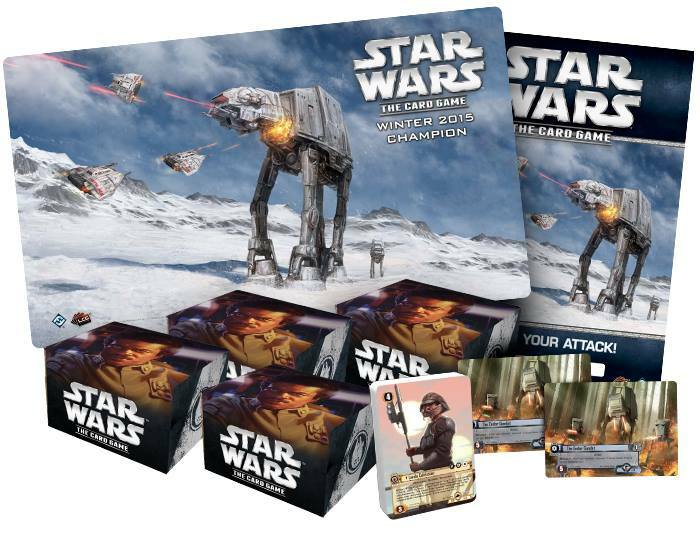 Plus a Battle of Hoth fate card? I mean, come on. This is a pretty standard Sith approach. 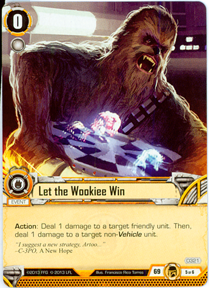 Get the Force, get your bigs on the table, and defend. Attack only if you’re feeling lucky. Vader + Sith events = dead units. Palp on the Force = Balance. Executor = insurance. 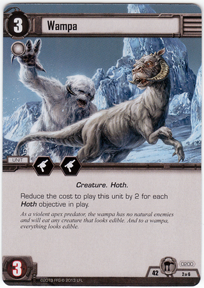 In a Hoth-heavy meta, Wampas (in Shadows) are stupid good defenders. ISB Liasions (in Executor) are underappreciated, decent little 1-cost units. Icetrompers (in Killing) are a little more effective than you might think. I thought we had a great first outing today. I hope each of you enjoyed it! As our meta progresses, I look forward to learning along with you how to enjoy this game more and more. I know several folks had prior engagements for next week, but we’ll still be there hopefully taking down my speeders. Good luck and may the force be with you!